Too busy to browse the bookstore? 'Healthcare Business Weekly Update' e-Newsletter and receive the latest trends, news and analysis in healthcare. Contact us for multiple print pricing or to order 25+ copies. Like the convenience of an instant PDF download, but still want a hard copy of this book? Order both versions and save 35 percent! Obesity rates doubled in the United States in 2008, according to a recent study in the American Journal of Preventive Medicine, making the condition a weighty contributor to healthcare utilization and spend. Despite early success on the management front, obesity is still tied to an estimated $117 billion in healthcare costs. 2011 Benchmarks in Obesity and Weight Management takes a comprehensive look at efforts in the healthcare industry to manage obesity and weight, based on recent market research by the Healthcare Intelligence Network. HIN's market research found that weight management is one of the top five disease management efforts for which financial and benefit-based incentives are offered. Healthcare reform is also rewarding prevention-focused programs, and this 25-page resource captures the efforts of more than 130 organizations in the prevention and reduction of obesity and related conditions and costs in their populations. and much more, including success strategies and member engagement techniques. This resource is based on responses to HIN's 2010 survey on Obesity and Weight management, in which 131 healthcare organizations reported on current and planned initiatives in this area of health concern. 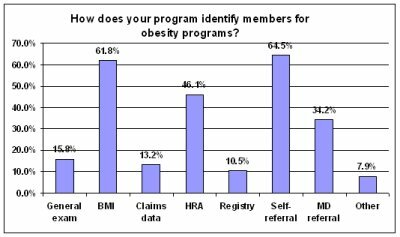 2011 Benchmarks in Obesity and Weight Management contains essential information to help you measure program effectiveness, improve overall population health and enhance ROI. Copyright Healthcare Intelligence Network. All Rights Reserved. eCommerce Software by 3dcart.